Leaking fittings and hoses can be easily detected however internal leaking through a bypassing cylinder of faulty control circuit can be very difficult to locate and resolve if you don't know how. Compressed air leaks cost you money in both excessive wear of your compressor and your all important power bill. If you think that your compressor is running a little more than usual, give us a call 02 4721 2766. 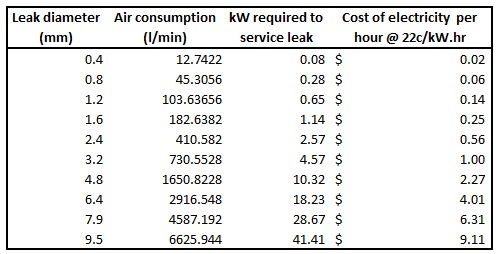 Use this table as a guide to determine how much your compressed air leaks are costing you. You can also work backwards to see how many leaks are in your system by determining an average power consumption per hour to give you an idea of the size of your air leaks. In large plants it can be sometimes hard to detect and fix leaks while production is going. Perhaps consider a leak tag system. A tag is tied onto the leaking fitting or valve in question when noticed by somebody. During a scheduled maintenance shutdown the tags are addressed accordingly.